I was walking in the forest again yesterday. I've really been getting lucky lately in that capacity. I still can't believe I get paid to do this. Yesterday must have been that sort of day in a bunch of of places, because I was thinking the exact same thing. 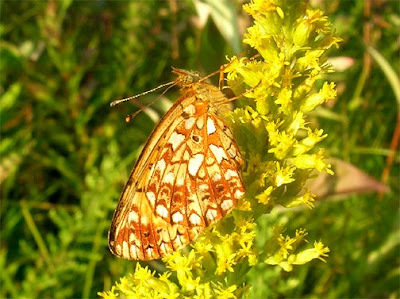 For the second year in a row, we have released Silver-bordered Fritillaries (Boloria selene) at Glacial Park in McHenry County. This species is in trouble over much of the southern edge of its range, including Illinois. Earlier this summer, some folks from my lab joined me down in Grundy County to collect females of this species. They laid eggs in the lab, and we've been rearing them all summer long. The adults have been emerging over the past week or so, and it's time to release them. It was a lovely day- bright sunshine with temperatures in the mid 70s. 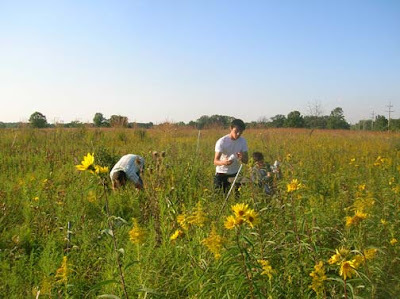 I was joined by Vincent, Brad and Robin as we hauled beer coolers containing chilled butterflies out to the prairie. We decided to do something a bit different this year. As the adults emerged, we placed them in a flight cage until we were ready to move them outside. This allowed them to court and mate in the cage. The result is that there is now one fewer thing that the released females need to do before they lay eggs and die. 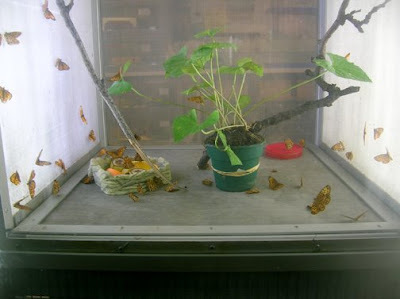 We know that this was successful because we saw mating activity in the cages, and a bunch of eggs had already been laid by the time we took the butterflies out. We allowed the butterflies to warm up, and then placed 70 adults on flowers. Today is a gorgeous day here in Illinois, and I'm hoping that the females are laying lots of eggs, even as I type this. We have about 150 chrysalides still to emerge. The week after next, once Vincent and I return from the Pacific Northwest, we will have to go back out to this beautiful place and do another release. Such is our lot in life. Think fertile thoughts for the fritillaries! Update: A few days ago I posted about recent forays to bring two other rare species, the Purplish Copper and Regal Fritillary, into the lab for breeding purposes. As of this writing, we have over 100 Purplish Copper eggs and several hundred Regal Fritillary eggs. The butterflies are still going strong. You go, girls! You do travel a lot don't you? You lucky dog! I love my work, but if I could change anything it would be replacing a huge chunk of my office time with an even huger (is that a word?) chunk of field time. Good idea to allowing mating prior to release. p.s. 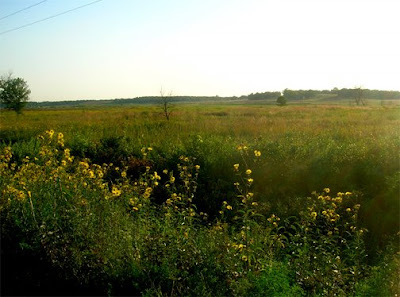 you really should see our loess hill prairies sometime, and I'm sure I would also enjoy seeing your gravel hill prairies. We are lucky aren't we. Thanks for the link. I've got to say I would have thought your post title would have been one of those google search phrase tests with all the interesting "things" going on if you will. Congrats on the Copper and Regal Fritillary eggs!!! I can't wait to hear more about those in future posts. you are a fortunate man this way. IKE is going by right now and it's raining and the wind is blowing, or I would be out doing some of this hard work. grin. FC- Thanks. I do travel a lot, though this work is all relatively close to home. Ted- I don't get to do nearly as much field work as I would like to. Any time you're out this way, I'd be happy to give you a hill prairie tour. cedrorum - I hadn't considered that about the post title. Oh, well. Fritillary egg count is now over 500. Troy- Thanks. Good luck with Ike. 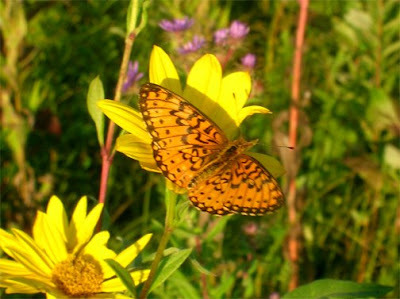 Your Silver-bordered Fritillary is as good looking as our Indian Fritillary. The release sounds like great fun. p.s. I too am extreamly lucky to be paid for engaging in my hobbies! I hope you brought an extra cooler with actual beer inside. It would have been the perfect capper for such a great day!